Published: Nov. 1, 2018 at 08:48 p.m. 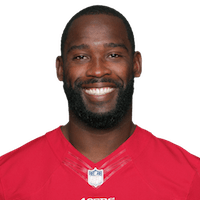 Published: Sept. 21, 2017 at 11:36 p.m.
San Francisco 49ers wide receiver Pierre Garcon goes deep and holds on for tough 59-yard grab. Published: Nov. 25, 2013 at 09:25 p.m.
Washington Redskins quarterback Robert Griffin III's pass is intercepted by San Francisco 49ers safety Donte Whitner at the 49ers' 35-yard line and is returned for seven yards.